Richard Matturro, who teaches in the English Department at UAlbany and lives on a farm in the Berkshire foothills, has created a pair of off-beat characters who seem altogether too right for the region — a teacher who has moved away from education and into the Department of Education’s bureaucracy and a woman from the upstate area who has moved away from life as we know it and into a mythical world of her creation. When these two meet through an ad in the personals column of a local paper the doors to heaven and hell, literally, open for both of them and they find a place from which there is no return. 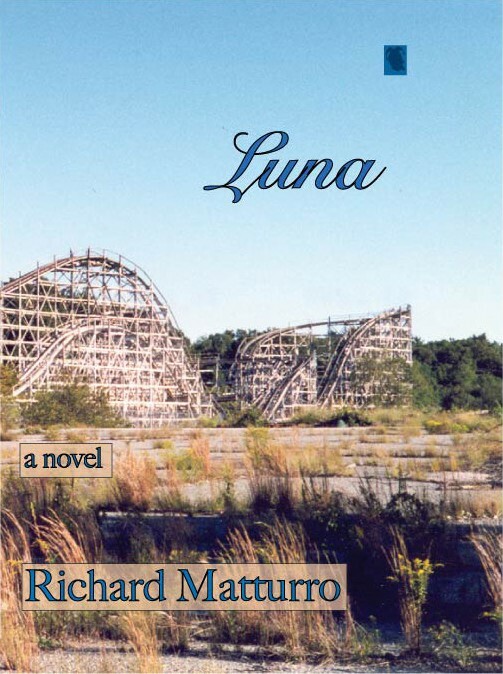 Matturro has a specialty in Greek mythology and Shakespeare and he uses his knowledge well in creating Luna, a young woman, boyish in appearance, with a fascination for rollercoasters. She never smiles, her name and her history are curious and fictional, she is free with her body, her opinions and her love. As her match, the author has invented a fortyish married man named Zach who has never even thought of straying outside the narrow parameters of his own world. Yet something catches his imagination when he reads Luna’s ad for a relationship: “Child of myth seeks god of desire. Abandon your past; relinquish your future; pursue only me.” Not really meaning to comply with every element described he enters into a friendship, then a relationship with this girl and it totally changes everything for him. Everything. Matturro displays a flair for language. He can be abrupt and succinct, as for example, Luna’s statement which haunts Zach: “I’m your lover now. You don’t have to do bad things anymore.” The simplicity of it provides complications in the life of a man with an assignment: reduce your department by two people. Instead of doing his work, he follows other courses in his life. The beauty in Matturro’s work is the constantly changing style and use of imagery. The author swings us through the protagonist’s moods as though we were the fulcrum on which Zach was balanced. We experience at a close second-hand what he feels. We do what he does, but with only a single second’s pause. It’s a very compelling author’s trick, a writing style that illuminates the legendary and focuses the reality. Where the book becomes a burden is the ending. A romance as intense as the one at the heart of Luna is almost impossible to sustain and the tragedy of a young life sacrificed to the heartfelt wish for happiness in another’s life is practically unbearable. Movies are supposed to make you cry. There we see and hear how the characters look, speak, react. In a book we have words, words, words and we can read them and understand the workings of the human spirit, but cry? No. In Luna we cry. There’s no resisting the urge, for Matturro draws his pictures with words, creates living and breathing people with words and fetches their hearts and minds out into the open with them as well. I was tempted, near the beginning of this book, to leave it for the most part, to skim and get through it, but once it caught me up in the happy tragedy of human interaction I couldn’t put it down, nor could I escape its mysterious central figure. Throughout the work there are marvelous figures in the classic tapestry of the life of Luna. None are as emergent as she. None are as carved in stone, nor as warm as flesh. Matturro has created a figure in a novel who seems to have lived and been drawn from life. She’s a work of art, but not right for every home. For a novel, she’s perfect.